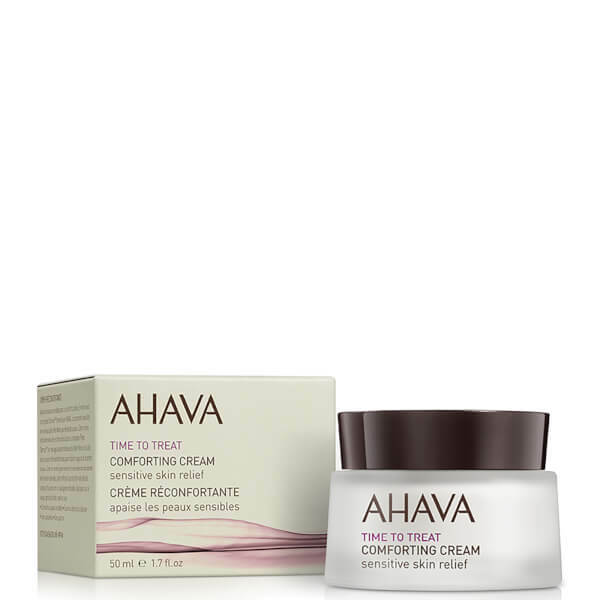 Catering specifically for sensitive skin, AHAVA's Comforting Cream works to relieve redness and irritation for long-lasting comfort. Infused with Dead Sea minerals, the lightweight, quick-absorbing formula helps to soothe and calm skin, whilst strengthening the natural barrier to leave your complexion feeling nourished and protected. Can be used to address extreme dryness, inflammation and flare-ups. Non-greasy. Apply daily on clean skin, whenever relief from redness, irritations, extreme dryness, or inflammation is needed. Aqua (Mineral Spring Water), Glycerin, Cyclomethicone, Stearyl Alcohol, Isohexadecane, Aloe Barbadensis Leaf Juice, Behentrimonium Chloride, PVP, Phenoxyethanol, Sodium Lactate, Maris Aqua (Dead Sea Water), Jojoba Esters, Narcissus Tazetta Bulb Extract, Simmondsia Chinensis (Jojoba) Seed Oil, Solanum Lycopersicum (Tomato) Fruit Extract, Squalene (Phytosqualene), Ethylhexylglycerin, Butylene Glycol, Calendula Officinalis Flower Extract, Propylene Glycol, Alanine, Creatine, Glycine, Magnesium Aspartate, Saccharide Hydrolysate, Urea, Glyceryl Stearate, PEG-100 Stearate, Stearyl Dimethicone, Dimethicone, Dimethiconol, Saccharide Isomerate, Panthenol (Pro Vitamin B5), Oenothera Biennis (Evening Primrose) Oil, Ribes Nigrum (Black Currant) Seed Oil, Allantoin, Bisabolol, Disodium Lauriminodipropionate Tocopheryl Phospates, Aloe Barbadensis Leaf Extract, Sodium Oxide, Dipotassium Glycyrrhizate, Camellia Sinensis Leaf Extract, Silica, Alumuna, Biosaccharide Gum-1, Hydrolyzed Corn Protein, Linum Usitatissimum (Linseed) Seed Extract, Lavandula Stoechas Extract, Diisobutyl Adipate, Hippophae Rhamnoides (Oblipicha) Fruit Oil, Silt (Dead Sea Mud), Lactic Acid, Lecithin, Ascorbyl Palmitate, Beta-Sitosterol, Hydrogenated Vegetable Glycerides Citrate, Tocopherol (Vitamin E), Pentaerythrityl Tetra-di-t-butyl Hydroxyhydrocinnamate, Citrus Grandis (Grapefruit) Peel Oil, Maris Sal (Dead Sea Salt).